Perhaps it is the eyes or maybe the inner soul that touches you when looking at one of Jacquie Pollitt’s (Jacquie Pollit Bears) bears. There is certainly something for everyone on Jacquie’s exhibit tables. Her creations range from antique to contemporary, from 6 inches to over 3 feet tall, both dressed and undressed, mohair to vintage mink. They all make ‘beary good friends’. “I try not to limit myself with any particular genre,” Jacquie remarked in her English accent. “I do what my imagination conjures up.” Even though she lives in Indiana, there is no mistaking that Jacquie originates from ‘across the pond’. Prior to discovering her bear making skills, Jacquie worked with horses but wanted a creative outlet that she could do from her home, giving her more time to raise her son Nick. When her mother-in-law gave her a sewing machine which had belonged to her grandmother, she unleashed a wellspring of talent and an addiction began. 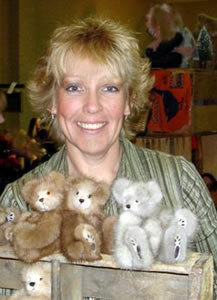 Jacquie started with inexpensive fur and sold her bears mainly at flea markets. Jacquie Pollitt with her small mink and fur bears. Sunny is small in size but big in lovability. 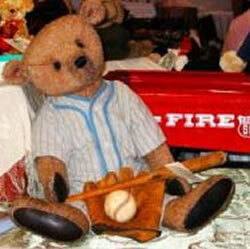 After all he made the front cover of Bears&Buds! 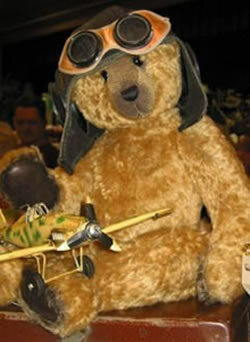 This aviator will take off with your heart! 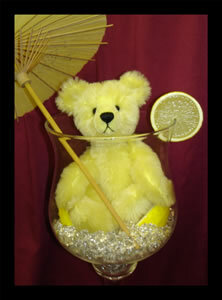 Jacquie enjoys making large bears too, using vintage clothing and accessories. 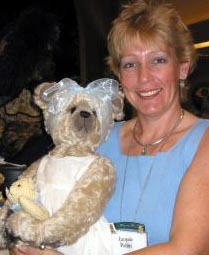 Teddy bear making has allowed Jacquie to be a stay-at-home mom. Nick is now 15 years old and Jacquie is still excited about exhibiting at shows and sharing her ideas and creativity with collectors and fellow artists. Best known for her Poppity Poo style bears which have curved limbs and are heavily weighted, she has worked with various renditions to create fairies bears, Scruffies and Bearskyn Robyn Flavours. She uses similar patterns to make mice and rabbits. All of which have the Threadbears style even though they are individualistic and unique. With the support of her family, Jacquie has made a name for herself in the collectible industry with her upbeat attitude and imaginative creations. Little did her mother-in-law know that her kind gesture, so many years ago, would provide the teddy bear industry with such a remarkably talented and caring artist. 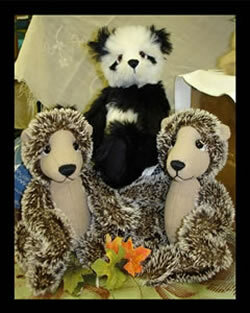 Jacquie uses recycled furs to make bunnies and bears. Lemon Ada serves up smiles. 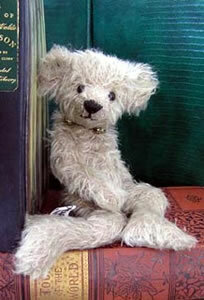 Scruffy gets his 'learn' on!